Stories, metaphors, and myths convey complex ideas, context, meaning and nuance that simple data cannot. By telling personal stories we build trust and connection, encourage imagination, and express the essence of who we are. 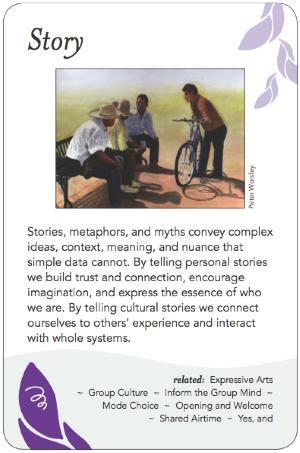 By telling cultural stories we connect ourselves to others' experience and interact with whole systems. A story is a narrative, a recounting of what is known and imagined in a way that places the factual and fictional parts of experience on equal ground. Most conversations are story constructs, and much of what we learn through communication is essentially story-telling. A story can be factual, invented, mythic, metaphoric, cautionary and visionary, often all at the same time, as many "voices" or individual interests can be represented in the same context. Improvisational stories allow for folks to "belch forth" undigested experience rather than simply engage in regimented argumentation - it allows the introduction of 'messy' experience which can then be processed as a group, and tends to connect better (give an 'emotional hit'). Structured stories, on the other hand, can be the result of centuries of refinement and conscious craft, thereby revealing important nuances of the culture and individuals that produced them. Stories can be a simple recounting (oral or written) or can entail movement, mime, masks, video, theatre and other embodied, sensory and multi-media forms of performance. Stories enable connecting on human level - shared access to human experience. They can build trust, when the story is shared, and knowledge of individuals in the group, and they are more memorable than simply reporting data or giving instructions. Stories provide context that is difficult to achieve in analytical reports and suggest an authentic way to convey feelings around an issue / event. They can be persuasive, even subversive, and can shock and shift worldviews by directly engaging values and beliefs. Perhaps most valuable at this time in history, stories can translate and build bridges across cultures. A story also provides value in the telling: in shaping the experience into a story and sharing it with the group, one takes a risk and invites trust. Stories always propose a worldview and can be manipulative, especially when facts are distorted or omitted, just as information may be presented as fact in order to obscure the truth when the stories behind the data's collection and framing are not shared. As a facilitator there is a fine balance between honouring a story and the time it can take with the group's need to move the process forward. It can be hard to discern whether a story is necessary or a distraction. Confidentiality can be an issue, especially if other participants or known parties are depicted in the story. There is also the risk of appropriation of a story - by participant or facilitator - without checking details, obtaining permission or citing the source when it is re-told. Telling stories to children is a way to impart knowledge and values, as well as to engage imagination, teach the child how to tell stories, and teach that the way stories are told can shape decision-making (politics) and cultures. An organization breaking into groups and telling their version of 'story' of the organization's past, future, etc., to provide a variety of perspectives and insights on the organization. One individual telling their story / vision of another. Every card on this site asks for stories: "Stories about Story pattern"
An example I have used frequently in facilitator trainings. At times, presence of Spirit occurs and is vital - but not predictable. Thomas King: The Truth About Stories: The truth about stories is that that’s all we are. The Nigerian story-teller Ben Okri says that “in a fractured age, when cynicism is god, here is a possible heresy: we live by stories, we also live in them. One way or another we are living the stories that are planted in us early or along the way, or we are also living the stories we planted — knowingly or unknowingly — in ourselves. We live stories that either give our lives meaning or negate it with meaninglessness. If we change the stories we live by, quite possibly we change our lives... We each write our own story. If the story that you are acting out today is not the story that you want to live, you have the power to change it. No one else can or will do it for you. At the end of your life, you will either be happy with the story you have lived, or filled with remorse. The choice is yours.